The 4th Kidical Mass Atlanta, sponsored by the Atlanta Bicycle Coalition and the Sopo Bicycle Coop, is coming to John Howell Park on Saturday, November 10th at 10:00 a.m.
Kidical Mass is a family-friendly, law-abiding bike ride. The purpose is to teach kids, parents and caregivers safety skills and provide a ride in which to practice them. Organizers from the Sopo Bicycle Co-op and Atlanta Bicycle Coalition hope to build awareness of the growing presence of kids and families on bikes, as well as the need for all road users to respect others. 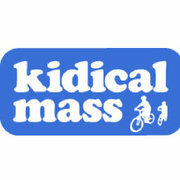 Kidical Mass brings together families who bike to build a supportive bicycling community. Kidical Mass rides are comfortable for families just starting out and biking on city streets for the first time but don’t completely avoid traffic. There is safety in numbers, not just on a group ride like this but also in the day to day world of riding in the city. This ride helps families experience that comfort, and hopes participants will grow to incorporate biking into their transportation menus in the future. The first ride in May 2011 was a hit, with 60 children and family members biking about 2 miles from Oakhurst to Downtown Decatur. Neighborhood residents on their porches fired up cell phones to photograph and film the “kidical” riders, who ranged widely in age, from toddlers on their parents’ bikes to older children and teens. The Virginia-Highland neighborhood Kidical Mass will start at 10:00 a.m. at John Howell Park, at the corner of Virginia Ave and Barnett St. The ride will be a 1 to 2 mile slow-paced, family-friendly social ride. The route will combine residential and connector streets to raise awareness. No road closures are planned for the event. This is a very slow-paced ride (avg. 1-10 mph). Riders are encouraged to share the fun by ringing bells, bringing noise makers, and waving to all. All types of bikes, trailers, trail-a-bikes, Xtracycles, longtails, bakfiets, long johns, tandems, folders, trikes, and whatever rolls are welcome. Organizers will give away Kidical Mass spoke cards andstickers at the ride start location at 9:30 a.m as the group gathers. By law in Georgia, all children 16 and under must wear a helmet. Parents and caregivers are strongly encouraged to model that behavior as well as safe riding practices. The ride will stop as many times as necessary to make sure the group stays together. Streets will not be closed. Riders can join or leave the group at any point. Guidelines for participants include personal responsibility (obey traffic laws and no group movements through stop signs and traffic lights), and parental responsibility for their own children by being aware of their location at all times. Additional volunteers are welcome – to get involved, volunteer, or ask questions email corny@sopobikes.org. Kidical Mass Atlanta information is available at atlantabike.org/kidical and sopobikes.org, or visit kidicalmass.org to learn more about this national initiative. This entry was posted in news and tagged 2012, cycling, johnhowellpark by John Becker. Bookmark the permalink.